We’d love your help. Let us know what’s wrong with this preview of The Parables of Jesus Coloring Book Devotional by Laura James. God's creativity is everywhere. It's mirrored by His creation--even evident in the illustrative teachings of His Son. This stunning book of 46 soulful, colorable pictures is based on the par Worship with art as you color-in 46 stunning illustrations based on the parables of Jesus, each with a corresponding devotion and prompts for spiritual reflection and artistic exercise. To ask other readers questions about The Parables of Jesus Coloring Book Devotional, please sign up. It seems like there is a coloring book to suit every interest and genre and while most started out for just children, now adults are experiencing a sense of peace and creativity in coloring as well. Whether you are a kid or a kid at heart, I believe you will love The Parables of Jesus Coloring Book Devotional by Laura James and Katara Washington Patton. This is something a bit different than your standard coloring book because while there are only 46 illustrations to color, the remainder is a de It seems like there is a coloring book to suit every interest and genre and while most started out for just children, now adults are experiencing a sense of peace and creativity in coloring as well. Whether you are a kid or a kid at heart, I believe you will love The Parables of Jesus Coloring Book Devotional by Laura James and Katara Washington Patton. This is something a bit different than your standard coloring book because while there are only 46 illustrations to color, the remainder is a devotional based on the parables of Jesus found in the Bible. I chose A Fine Pearl to focus on from Matthew 13:45-46. It illustrates not only where pearls are formed and found, but understanding how Jesus uses this illustration pertaining to the Kingdom of God. A person who harvests pearls know when he has found a rare and perfect one, like the hidden treasure it was until it is opened and revealed, much like us. We fail often times to find value in ourselves, but we need to understand how precious we are to God and how important our relationship is with Him to secure our eternity with Him. It isn't something that can be bought or sold. Are you willing to do what is necessary to secure your eternal future? What are some of the things you need to rid yourself of to better enjoy the Kingdom of God today? Then a beautifully illustrated picture follows so you can focus on finding the beauty in what you color and create. The Parables of Jesus is a coloring book and devotional in one. Each of its 46 readings focuses on one of Jesus’ parables. The coloring picture that follows relates to the reading. The devotional readings begin with the parable or part of it quoted from the Bible. The entry lists, as well, other places in the gospels where Jesus tells the same story. The devotional readings include a variety of things such as explanations of the first-century customs behind the word pictures in Jesus’ story, how The Parables of Jesus is a coloring book and devotional in one. Each of its 46 readings focuses on one of Jesus’ parables. The coloring picture that follows relates to the reading. The devotional readings include a variety of things such as explanations of the first-century customs behind the word pictures in Jesus’ story, how the people in Jesus’ day might have understood the parable, and a practical application from Jesus’ picturesque stories to our twenty-first century lives. Devotions end sometimes with a prayer, sometimes with a question to answer, and sometimes with a challenge of how to apply the parable to life. Devotional pages are framed on one corner with a leafy border—also to color. Each devotion and coloring picture is printed on the right-hand (odd-numbered) side of the page with the opposite side blank—except for when the devotion needs more than one page, and it completes overleaf. The book is printed on heavy white paper, suitable for a variety of coloring media. The book concludes with two lined pages for notes. I found the devotions drew me in and helped me to know how to better relate to and apply these familiar but sometimes mysterious stories. The format with its left-side pages of white space made the book feel uncluttered and peaceful. Users could write their own thoughts and responses to the devotions in the space or leave it blank. The consistent style of the drawings throughout gives this coloring book the appearance of an illustrated picture book. The illustrations would only be enhanced with color added, making it a perfect book to color and give away as an illustrated devotional. This is a beautiful and inspiring book, designed to provide hours of coloring meditation. I received The Parables of Jesus Coloring Book Devotional as a gift from Hachette Book Group for the purpose of writing a review. This stunning coloring book is composed of 46 inspiring parables designed to help Christians know how God expects them to live their lives. The coloring pages themselves correlate to the story on the page ahead of it, allowing for a coloring page per story. Take a moment to learn from these parables and color these stunning images. I thought that this was an interesting idea for a coloring book. There are many different devotionals out there, but this is the first coloring book devotional I have This stunning coloring book is composed of 46 inspiring parables designed to help Christians know how God expects them to live their lives. The coloring pages themselves correlate to the story on the page ahead of it, allowing for a coloring page per story. Take a moment to learn from these parables and color these stunning images. The Parables of Jesus coloring book devotional is unlike any other Christian coloring book that I have seen. Besides containing a devotional, this book also contains pictures that are a modern artist's rendition of Bible stories. They remind me of some of the beautiful stained glass windows that I have seen at some old churches with their bold lines and beg to be filled with bright colors. The devotionals in this coloring book all contain a Bible verse(s)followed by reflections on the verses for The Parables of Jesus coloring book devotional is unlike any other Christian coloring book that I have seen. Besides containing a devotional, this book also contains pictures that are a modern artist's rendition of Bible stories. They remind me of some of the beautiful stained glass windows that I have seen at some old churches with their bold lines and beg to be filled with bright colors. The devotionals in this coloring book all contain a Bible verse(s)followed by reflections on the verses for each devotional and concluding with a prayer or a closing thought/activity/question related to the verse. Because this book contains parables from Jesus, as one would expect, the readings are all from the Gospels of Matthew, Mark, Luke and John. This large, beautiful book roughly measures 10 inches square and contains 46 illustrations that correspond with each devotional. For coloring purposes, each picture is done on heavy paper with a blank back side making it nice to use for various mediums that you wish to work with. I still prefer colored pencils but I know other people like to work with markers or water colors. This book could work for those mediums with pulling out the page or putting protection behind the picture you are working on. The Parables of Jesus coloring book would be a nice book for any creative person to use for their devotional time with God. I highly recommend this book for those who would like something different to color and study. Adult coloring books are popular, encouraging people to slow down in our frantic culture. This book presents the opportunity of relaxing through coloring and being inspired by parables of Jesus. The text page contains the text of the parable, from one of a variety of translations, then a devotion based on that parable. A prompt for spiritual reflection or a prayer is included as well. Next is a blank page and then a page including an illustration that can be colored. I found this odd as there is Adult coloring books are popular, encouraging people to slow down in our frantic culture. This book presents the opportunity of relaxing through coloring and being inspired by parables of Jesus. The text page contains the text of the parable, from one of a variety of translations, then a devotion based on that parable. A prompt for spiritual reflection or a prayer is included as well. Next is a blank page and then a page including an illustration that can be colored. I found this odd as there is a blank page in between the text and the illustration. When coloring the illustration, opposite it was a blank page, the text for the illustration being on the previous page. I would much rather have had the text opposite the illustration. I could have then reviewed the parable while coloring. As presented, the text and illustration seemed disconnected. I suppose it allows for removing the text and illustration pages and displaying them, as the backs of both pages would be blank. I found some of the illustrations a little disconcerting. The unusual positions of mouths and the oddly tilted heads seemed to make me less relaxed, not more. I found the devotions based on the parables to be insightful and encouraging. I do recommend this book to those who enjoy coloring or doodling. You will have the opportunity to do so as well as read good devotions based on the parables. The Parables of Jesus is large and beautiful adult coloring book. It contains the parables of Jesus including the actual Gospel reading, a description and discussion of that reading, and some questions to ask yourself about the passage. Afterwards follows a detailed picture illustrating the parable for the adult to color. The pictures are on thick white paper that is easy to color. The binding is glued. The pictures were of good detail for me to color with my coloring pencils, but not very fine The Parables of Jesus is large and beautiful adult coloring book. It contains the parables of Jesus including the actual Gospel reading, a description and discussion of that reading, and some questions to ask yourself about the passage. Afterwards follows a detailed picture illustrating the parable for the adult to color. The pictures are on thick white paper that is easy to color. The binding is glued. The pictures were of good detail for me to color with my coloring pencils, but not very fine detailed – which I like. Some coloring books are so finely detailed, I have a hard time coloring them with my coloring pencils. What I liked best about this book was that it is an excellent way to relax while you are coloring and also spend devotional time reading and thinking about the parables. The parables are wonderful parts of the Gospel and I like how this book applies them to everyday life. 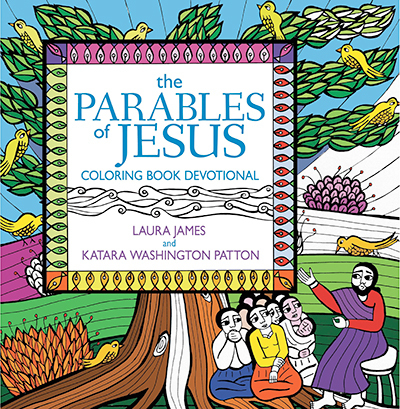 The Parables of Jesus Coloring Book Devotional by Laura James and Katarah Washington Patton is both a coloring book and a devotional. The pages are fun to color in, and using the book is also a nice way to brush up on Jesus’ parables. Perhaps a Sunday school class could use this book for a lesson on some of the parables! Because the book is a combination of a coloring book and devotional, it is easy to imagine reading one devotional page and completing one coloring page each day. 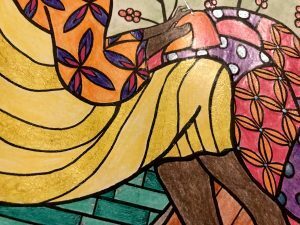 (Each devotional The Parables of Jesus Coloring Book Devotional by Laura James and Katarah Washington Patton is both a coloring book and a devotional. The pages are fun to color in, and using the book is also a nice way to brush up on Jesus’ parables. Perhaps a Sunday school class could use this book for a lesson on some of the parables! Because the book is a combination of a coloring book and devotional, it is easy to imagine reading one devotional page and completing one coloring page each day. (Each devotional page corresponds to one coloring book page.) The illustrations remind me of ancient drawings, with an appealing archaic look. The coloring book pages include illustrations that require fine detail as well as illustrations that do not require fine detail. My favorite devotion in the book was “Bear Fruit,” a lesson based on Luke 13: 6 – 9. The corresponding coloring page features a fruitful tree with two people beside it, just waiting to be brought to life through colored pencils! 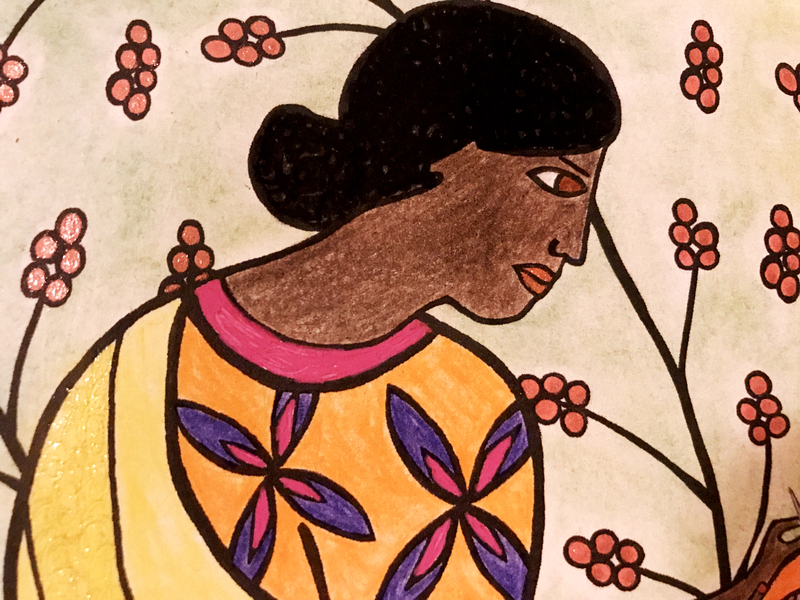 The Parables of Jesus adult coloring book is a fun way to learn about Jesus teachings. For each lesson, the parable is written first, along with a discussion, an activity, and coloring pages. I enjoyed the activities because they can be done as a family while having your own discussion on the parable. I believe families and individuals should give this devotional a try as an exciting way to spend time with the Lord. This devotional would also be good for homeschoolers to use during their Bible The Parables of Jesus adult coloring book is a fun way to learn about Jesus teachings. For each lesson, the parable is written first, along with a discussion, an activity, and coloring pages. I enjoyed the activities because they can be done as a family while having your own discussion on the parable. I believe families and individuals should give this devotional a try as an exciting way to spend time with the Lord. This devotional would also be good for homeschoolers to use during their Bible time. A whole week could be spent on one devotional. The illustrators, Laura James and Katara Washington Patton, did a magnificent job designing the book. I recommend it to families, individuals, and homeschoolers. My son and I both enjoyed coloring in this book while talking about the parables. The finished pages looked amazing. We showed them to friends and they agreed- this is an enjoyable way to pass the time while reducing stress. Use them as part of your devotions or just enjoy the process. The images are not difficult and are relevant so the whole process is fun. I received a single copy through Hachette Book Group in exchange for an honest review. The parables of Jesus come alive for children in this book. The text is simple and well written and the illustrations are clear and bold. A great tool for the craft room and homeschool classroom. This is a wonderful coloring book. I love the pictures and the way that the devotional and the pictures are connected. 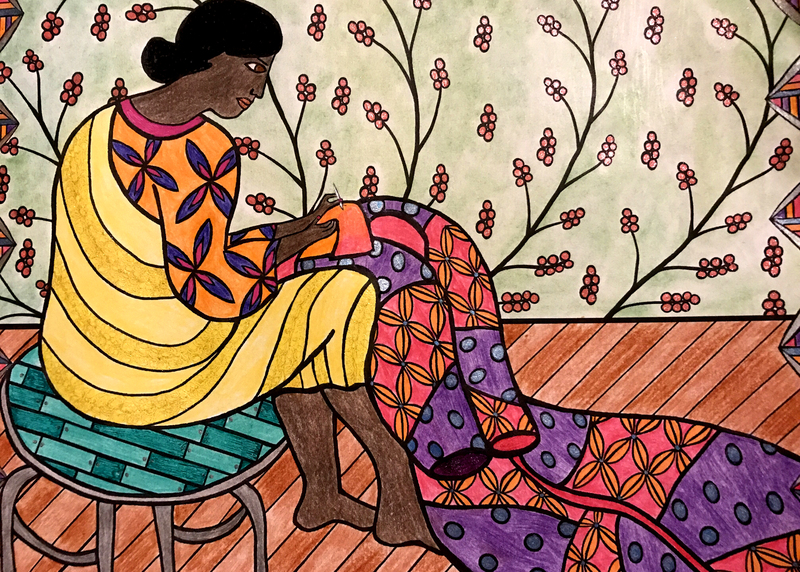 What better way to reflect on the devotional you just read, than color a picture about it? This really helps you to comprehend and remember what you read and what Jesus was referring to. The parables Jesus gave to the people were important and things that we need to know. However, some of them were difficult to grasp. This not only gives the explanation of what Jesus was talking This is a wonderful coloring book. I love the pictures and the way that the devotional and the pictures are connected. What better way to reflect on the devotional you just read, than color a picture about it? This really helps you to comprehend and remember what you read and what Jesus was referring to. The parables Jesus gave to the people were important and things that we need to know. However, some of them were difficult to grasp. This not only gives the explanation of what Jesus was talking about, but the pictures bring it to life. I love that a relaxing hobby, like coloring, can also be used as a way to deepen your relationship with Christ. The Parables of Jesus a Coloring Book Devotional by Laura James and Katara Washington Patton is like two books in one! Not only do you get a coloring book filled with beautifully-drawn illustrations of imagined scenes in Jesus' parables, but you also get thought-provoking devotionals based on the corresponding Scripture passage. 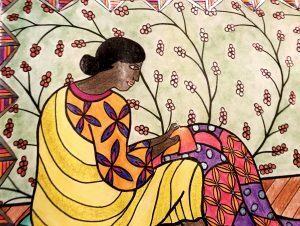 Both the author and illustrator are African American women who love Jesus and have expressed their personal journeys of faith on these pages. 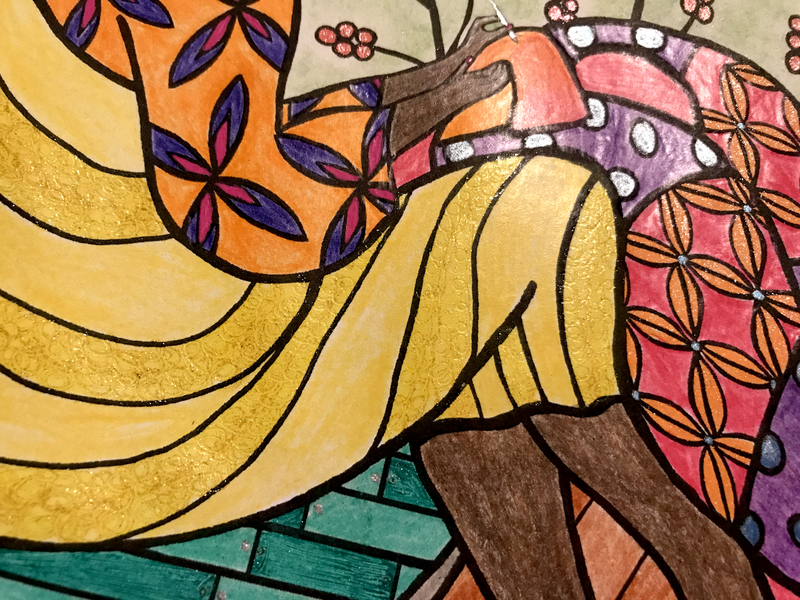 The illu The Parables of Jesus a Coloring Book Devotional by Laura James and Katara Washington Patton is like two books in one! Not only do you get a coloring book filled with beautifully-drawn illustrations of imagined scenes in Jesus' parables, but you also get thought-provoking devotionals based on the corresponding Scripture passage. Both the author and illustrator are African American women who love Jesus and have expressed their personal journeys of faith on these pages. 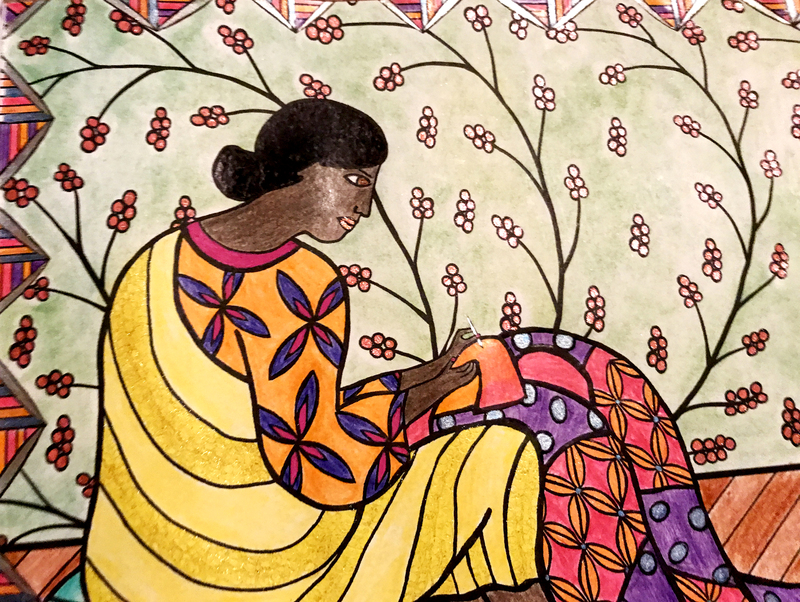 The illustrations were created with people of color in mind across all ethnicities, which is helpful, since so many coloring books reflect the Anglo-Saxon or European culture. The characters in each parable were purposefully depicted in such a way that anyone, regardless of nationality, could color them and reflect their own (or the Jewish) cultural heritage. The layout is set-up so that you read the devotional first, and then as you color the detailed pictures, you reflect on the scripture passage that you read and the author's insights. You can also use this time to practice a little introspection and self-examination in response to the parable. The author insightfully explains the parable, and concludes the devotion with a few thought-provoking questions about how to apply the lesson in our own lives. 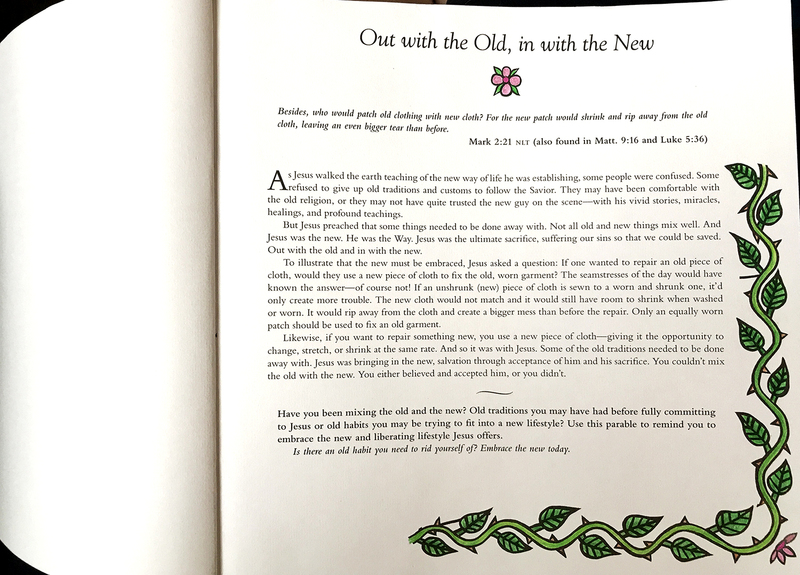 The next page contains a full-page illustration of a woman sewing a patch onto a beautiful robe.While I was coloring the picture, I reflected on the devotional, and the questions. It gave me the perfect opportunity to turn my focus to the Lord and relax while meditating on the Word. the foolish man builds his house upon the sand. The Pharisee who prayed loudly vs.
Each page containing a devotional reflection is laid out the same with the exact same leafy frame, so you would have to get creative if you don't want each one of those to look the same; however, those really aren't the pages you're going to want to color. The thick pages measure roughly 10" x 10" and are printed on only one side, which is great because you don't have to worry about ink or watercolors bleeding through to the next page. 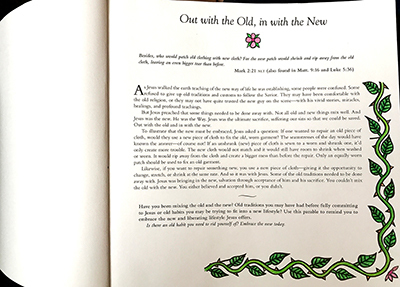 (In the off-chance the colors do soak through, they will transfer onto the following devotional page which features the exact same layout and design pattern as all the other devotional pages, NOT one of the illustration pages). In other words, it's a no-worry coloring book that will minister to your soul! As part of my evaluation of the book, I used a variety of media including chalk, colored pencils, and glitter gel pens. I had zero bleed through! What really surprised me, though, was how the book held up when I accidentally spilled a drink on the picture I was coloring. 😱 (It wasn't a full cup, but it was enough to get all over the page.) I quickly blotted it dry, and much to my surprise, you cannot tell that I ever I spelled anything on it! Finally, and this is just a bonus: The authors use a VARIETY of translations for the devotions. This is so refreshing! One day, you'll read from the Living Bible Translation; another day, you will read from the Amplified Version; and on another day, you will read from The Message; and so on. I'm very impressed with The Parables of Jesus Coloring Book Devotional, and I definitely recommend it to anyone who loves to color. It would make a great gift, too! There is more than one author by this name in the Goodreads data base.